Also you can submit your own links. This week, everything is ON EXTREME SALE. It’s the first time ever when we give such a large discount on a mass campaign. Get any 2 components at 70% discount! Tip. You can add more than 2 products and still get 70% of the total amount. This is a special offer available for the items above, and it does NOT apply to upgrades. 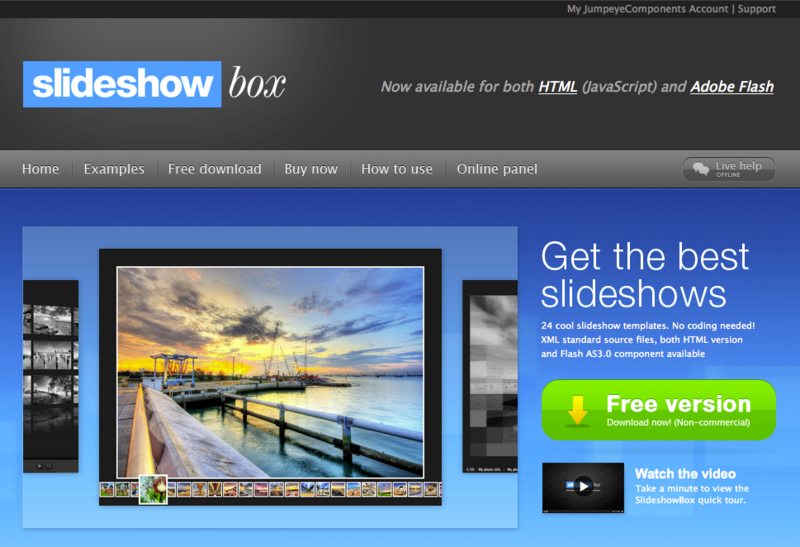 You need to get a minimum of 2 components from JumpeyeComponents.com to use the coupon. Watch the whole Google I/O keynote here. We represent a community of over 150,000 Flash developers and we’re trying to keep up with everything related to the Web, and especially to the Flash technology. Since we heard a lot of questions and answers about what’s going to happen to the Web after the restrictive moves that Apple has made, we felt that somebody neutral to this cold war needs to shed some light on the issue. Video is the most important media consumed on the web and finally something else than Flash can play video in the browser (not so well though) – this is why Flash and HTML5 are somehow seen as competing technologies. While many people claim that HTML5 is ready for video streaming, that’s not the actual fact. HTML5 doesn’t support streaming nor progressive play. Also there is no support for live broadcasting, or teleconferencing. All these can be achieved only with Flash and it has been this way for many years now. What can be done using HTML5 is playing videos, not streaming them. All major websites (like Facebook, YouTube, MySpace, etc.) when they need to capture video and audio they rely on either Flash or some desktop app that has to be installed specifically for this task. All those fancy augmented reality sites that just started to emerge are based on Flash video captured directly by the device’s camera, and this can only be achieved in Flash. Most file uploaders that really work are made in Flash. Also, Flash has just introduced full support for touch screens and gestures; we’ll going to see some cool things evolving from this in the near future! Most people install (or update) Flash Player because of a game they want to play at any cost. Warning: tech lingo ahead! There are some technologies that are needed for the browser-based games to evolve: object-oriented programming support, 3D frameworks, advanced math calculations, collision detection, contextual FPS, full-screen layer, event model, peer-to-peer (this has been around for over a year now), fast graphic filters (such as pixel bender), gesture support, RTMP and AMF protocols for fast and accurate data synchronization, the ability to send objects through these connections (not just string variables), and media servers especially made for data synchronization – to name a few. The point is, Flash supports all these technologies, and it does it great. It’s obvious why so many developers choose to use Flash to create in-browser games. The fact that Flash is such a flexible technology is enough to support the idea that Flash is not going to die, but on the contrary, it’s going to rule the next decade and continually raise the standards. The new advertising era is here. Whether you want to create a cool interactive corporate ad, like any of those showcased daily on the BannerBlog, or you want to create an animated flash banner that runs on multiple devices, Flash is the way to go. More powerful than a GIF or JPG, a Flash banner can create near cinematic experience in a 10th of the size of a video while enabling rich interactions that can significantly increase users’ attention. With online tools like BannerSnack.com, hundreds of thousands of people all over the world have built Flash banners without actually writing a line of code, and there are more and more apps that allow anyone to create Flash content, right in the browser, without any programming skills. This rapid growth of Flash content “developers” can’t be overruled by the growth of the Objective-C community. That just won’t happen anytime soon. Over 7 years ago, a whole set of tools started to emerge along with a new Flash IDE at a two-year interval. Now there is a solid base of thousands of free and premium Flash tools, components and frameworks that just make a developer’s life much easier. Also, at this moment, there is no other language, other than AS 3.0, that brings so much of the OOP (object-oriented programming) and high-level programming into the browsers’ world. A language that has such a healthy natural growth is unlikely to fade out. There are many kinds of safety-related issues that we can look at: your computer’s safety, your safety as a computer user, your company’s intellectual property, your code’s copy and distribution protection, etc. Flash enables the possibility to protect both the end user and the provider (and also the host). Maybe one of the most important facts about Flash is that Flash movies are compiled before they get published on the web, meaning that the images, video, audio, texts, fonts and code inside these movies are protected from hacks and abuses. This is one of the reasons why there are so many successful Flash components (like FlashEff or SlideshowBox) out there. Flash authoring is safe. Also, hacking Flash is not an easy task. If you really want to protect the end-user, this is the way to go, because Flash Player can’t take control over computers or mobile devices. Due to the costs involved, some of these devices will not be able to run more than text and they may not even support CSS. Some devices will not be able to run more than one frame per second and will display only black & white graphics (Kindle is the most obvious example). However, the devices that are powerful enough to run Flash and AIR will certainly enable these plugins because obviously this adds great value to the devices and extends their potential use. The point is, at least for now, Flash is the best cross-platform technology that enables users of different devices and operating systems to access and create rich media content at the highest level of performance. Unfortunately, some less capable devices will not support multitasking and processor-consuming tasks and therefore they will not be able to run Flash. However, the strong competition in the market will make this “unadapted” devices to fall behind just like the iPhone 3GS is currently losing ground in the fight with the much powerful Droid. Progress always takes what’s good and makes it better. If we can agree that in the past 5 years Flash has been the only game in town, then we should be able to make the assumption that everything that comes after it should either evolve from it or be able to outperform it in all respects. If Flash has a real advantage over any other technology (and it has), it will thrive. We, the Smartketer team, have attended to many IT events, and we can say for sure that there’s nothing that can compare to a Flash conference. You won’t find so many creative people in the same place anywhere else! If there’s something else that can be considered close to a FlashOnTheBeach conference for instance, it will certainly be a C4 conference – an unofficial Mac event that has been put on hold this year by their hosts in order to let Apple know that they’re not supporting the section 3.3.1. If there’s something that makes Flash so unique, it’s the people that constitute the Flash community. We’re making a short creative movie/(FlashEff 2 story) that will extensively use the new FlashEff 2 and After Effects. We’re trying to find out which are the most important 10 things creative people use. Our guess includes the following: Macbook Pro, iPhone, Coffe, Guitar, Junk food and, of course, Twitter.For anything that you have in mind, please drop a comment. Also, all eligible submitted patterns will be instantly rewarded with a copy of FlashEff Premium Unlimited. 1. You have to make sure it works correctly with FlashEff. Patterns that have functional issues will not be approved. 2. It is owned/developed by the same person/company that submits it. 3. The code should be open for us to evaluate. 4. No third party code should be used unless you have a written agreement that lets you use it. 5. You have to make sure it is not an illegal copy or a very similar approach as another pattern. 6. It should be submitted before October 31st 2008. To select the best patterns from those that will be found eligible, we will evaluate each pattern by the following criteria: uniqueness, artistic look, visual quality, code quality and most of all: popularity. The final decision will be given by popularity, by vote. After October 31st we will publish all the submitted patterns as swf movies for people to choose between them and vote. The patterns earning the most votes will win. Important! At least 1 but not more than 3 prizes will be given as stated above. How to use Embed TxEff on your blog? Con MySpy ? possibile il controllo remoto di alcune funzioni ma non permette di disinstallare da remoto alcuna funzione: in alternativa, per?, consente il blocco remoto di App, siti web e dello stesso dispositivo spiato.Una funzione molto potente ? il keylogging che permette di visualizzare ogni informazione digitata nel dispositivo ?controllato?. controllo navigazione internet dipendenti Dall?altra parte, per?, l?idea di PlaceRaider potrebbe essere tranquillamente applicata in altri ambiti, utilizzandolo ad esempio come strumento da impiegare nel campo dell? architettura o del design . 3. Paste it within your posts and publish. Since we just started this , we have a promotional offer: send us a link where you have posted an embed TxEff and we’ll send you a free TxEff with Reflection (a non-commercial limited edition upgraded version of the TxEff component). The name says it all. It’s a text effect component for Flash that will change the way you look at text. It’s specially designed for Flash users and designers that want a quick and easy way of animating a text without any coding. The free basic component contains 3 patterns. The number of patterns doesn’t limit you because in each pattern you can try numerous params. As you will find out for yourself this will just open your appetite for more ways of animating. You don’t have to explore every possible combination of params, we want to help you enrich your number of effects, all you have to do is access the TxEff website http://www.txeff.com/. This is not only a website it’s practically an effect DataBase, on which every time a TxEff user discovers a new effect, he can share it with the rest of the TxEff comunity. If you go online and see something you like just copy the effect Id and paste it in your Component Inspector and you will have the desired effects without having to think of them yourself. Enter our TxEff community and get all the benefits that come with it.The component itself is very user friendly. All you have to do is to write the text, access the TxEff component and tweak the params to get the desired effect, drag and drop the effect on text and you have a fully animated text. TxEff is the result of months of development and the feedback we got from our clients. We spent time thinking what our clients would want and offer them that special something. Everyone on the team came up with innovating ideas on how a text effect component should look and act. The result is a very user friendly, time saving component that doesn’t require any coding. Get the full licensed TxEff which contains a minimum of 50 patterns by March 2008. We’re continuously developing new and complex patterns to suit your artistic need and all this for only $99.97(promotional offer). There’s more, if buy it in December you will get MCTE for free, or if you have already purchased it, you can get it’s value in discount coupons. Last week we finally launched the ActionScript 3 versions of our V3 components. So now, when you buy aV3 component, you get the AS2 and AS3 versions (AT THE SAME PRICE 🙂 ). The differences between the two versions of the same component are not so great. They consist mostly in the way the events and event listeners are used (the AS3 versions use the new method with an event class for each component and constants declared for each event). You can find more details about the new way of handling events in the documentation corresponding to each component. However, a few of the components, will also have new properties and methods (this is the case for the AS3 version of the Loader Pro V3 component, which has a new feature: reflection). For each component, the documentation lists properties and methods used by both the AS2 and AS3 versions and, separately, new properties, methods and events used only by the AS3 version. We’re also working on the AS3 version of our tutorials, so, soon enough, we’ll have them available on the site. Further more, each component has on its page (“How to use” section) issues from our Knowledge Base regarding that particular component. For now, only the AS2 issues are available, but as soon as we translate those issues to AS3, we’ll make them available, too. Regarding the trial versions of our AS3 components, we will release them only when the encryption software used by us will be available for ActionScript 3. So, now, if you plan to try out our components, you only have AS2 trial versions available (which won’t work in an ActionScript 3 project). We are really glad that you (our clients) like our components and we hope that the new AS3 versions won’t let you down.